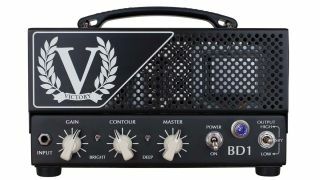 NAMM 2016: Rapidly rising Brit guitar amp co Victory has unveiled the BD1 compact head as a black-finished alternative to Rob Chapman's bright red RD1 Signature model. Aside from the finish, the BD1 shares its feature set with Chapman's guitar amp, eking 28 watts from a pair of fixed-bias EL84 output valves, with a single channel offering everything from clean to break-up and full-on overdrive. A bright switch, deep switch and contour control offer additional adjustment over the amp's voicing, while output is switchable down to two watts for playing at home and recording - and the whole package is just 263mm wide and weighs 6kg. The Victory BD1 is available from January 2016 for £599/$849/€679 - Victory Amplifiers has more.